Let's limit our discussion on tanzanite silver rings to well designed and crafted jewels that are set with, natural good gem quality tanzanite stones. To be honest there is no shortage of silver tanzanite rings in the markets but, insist on quality and most of them would fail to fulfill the requirements. Much of the respect that silver has gained in the past 5 to 7 years has come from, quality conscious jewelry lovers. With this has come the demand for fine craftsmanship, innovative designs and good natural gemstones for silver rings. For Kaisilver the quality standards for silver rings comes as no surprise, we have always given the same craftsmanship, gem selection and attention to gold and 925 silver jewelry orders. Most you would have heard of tanzanite gold rings but, is the gem really suitable for sterling silver rings as well. The technical explanation for this is simple, there is no reason why any gem can be set only in gold or platinum and not in silver. Jewelers have preferred to stay away from crafting quality silver rings for two simple reasons, the first relates to the higher profit margin that gold jewelry provides. The second is the older trend where buyers expected silver rings to always be cheap and very affordable. If you wish to get a tanzanite sterling silver ring that is well crafted and set with a good grade natural tanzanite gem, opt for a custom made ring. It is very unlikely that merchandise sold off the shelf, will satisfy you in terms of quality features. A custom silver tanzanite gemstone ring will allow you to pick your own choice of design, gem size and dimensions and even the color shade of the gemstone. And since very few casual jewelry buyers will have expertise on jewelry and gemstone details, choosing the right custom jewelry provider becomes very important. You need a jeweler who can guide and advice rather than, hard sell a product. 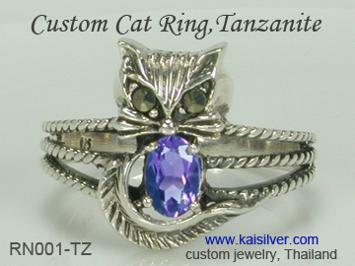 One difference between silver and gold tanzanite rings that needs to be addressed relates to, silver tarnish. While gold will tarnish as silver does, it is not tedious to clean and maintain a silver tanzanite ring. Lets talk about that right here. To begin with never leave a silver ring to remain tarnished for long. It is best to do the cleaning the moment you notice the discoloration that tarnish brings, if you allow the tarnish to remain and grow stubborn - professional help might be required to do the cleaning operation. A bowl of clean water, few drops of mild liquid soap, a piece of soft, clean and dry cloth and a soft toothbrush, is all that you should need to clean your tanzanite 925 silver ring. To polish away tarnish on the silver metal, you can use any recommended silver polish fabric or lotion. Follow the instructions that came with the polishing material and then, get into the process of cleaning the ring with the toothbrush and the bowl of water. In the final stage, rinse the ring thoroughly in running water at room temperature. This will take away any residue from the cleaning process or material that, might be stuck to the stone or the metal. Once the tanzanite silver ring is polished and cleaned, dab it gently (not rub) with the soft cloth to absorb water droplets. Leave the ring on the cloth in a safe place, allow it to dry on its own. Do not attempt to use blowers or heated hair dryers to hasten the drying process. A few short notes about looking after tanzanite gems and jewelry, these are true irrespective of the metal that you select for your tanzanite ring or jewelry. Most gems including tanzanite should not be brought into contact with, strong solvents, detergents or acids. Heat and ultrasonic cleaners should not be used to clean tanzanite gems or jewelry. Something that we would strongly recommend for all jewelry is to, keep them away from environments where they can get struck by physical impact. When storing jewelry use a jewel box that has separate padded compartments for each jewel, never bundle jewelry together when putting them away. Irrespective of whether you buy a silver tanzanite ring or from where you plan to buy it, you are welcome to take advantage of our expert team to clear any doubts or queries that you might have. 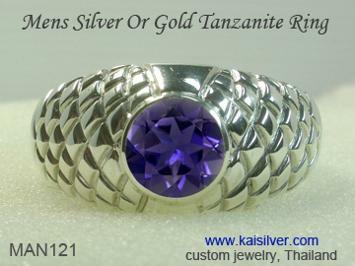 Kaisilver: We craft all jewelry including gold and 925 silver tanzanite rings with the design of your choice. By procuring gems from almost every mining site on the globe, we deliver maximum value for the price paid by our clients. You can pick any design from our website and request for it to be crafted in gold or 925 silver with gems of your choice. We also welcome your own design ideas and concepts to be custom made. More than 7,000 jewelry lovers spread across 17 nations, proudly wear jewelry crafted by the highly skilled artisans who work for us. Email us at sales@kaisilver.com with any questions or requirements that you might have. We will be glad to share our expert knowledge with you even if, you do not plan to make any purchase from us. Fulfilling the desire of men for a quality 925 silver gemstone ring. Showcasing the rarest gemstone of all time, in a finely crafted sterling silver ring. Choose the texture of your choice, all ring size requests can be accommodated ... more. The four century old claddagh legend, celebrating history's most meaningful full jewel. 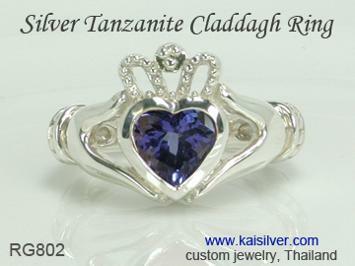 The historic claddagh silver ring with a heart tanzanite gem stone. Wear it or gift it, the love, friendship and loyalty theme grows on you ... more. The cutest cat ring set with the gorgeous African beauty. A 925 silver tanzanite ring, crafted by the highly skilled artisans of Thailand. Perfectly priced for a self purchase and amazingly suitable for a gift for someone truly special ... more.